Hi, but are the bearings tight or loose? I have too much play I do not understand what it depends on, and then the 3mm rods glued to each other ?? Hi, thank you very much for the support, I checked everything and printed a 30 x 30 cube and it prints very well with the caliber. Size 30.1 so almost perfect, but I used pla, printing with nylon changes something ?? but the 3mm x 19 rods glued to it ?? Or are they just pushed and inserted? the truck was designed for PLA. Nylon will shrink a lot more. PET-G also will shrink slightly more then PLA. i recommend just a few parts printed from nylon. the small 4 bevel gears in the center and axle diff(12 total), and the 4 wheel axles(inserted into the rims). PET-G would work better for the suspension arms for some collision flexability the rest just PLA with good fusion on the layers. the 3mm rods just slide in no glue. I like to glue the large bevel gears to the axle shafts so the shafts do not come out of the gear ends. i recommend changing the dogbone style shafts to CVD style. there are a few remixes on changing the drive shafts. depending on your gear mesh you might need my 29T lower axle diff replacement gears. The wheel pins, for example, how did you print them in nylon? Have you increased the print flow or the dimensions etc ?? every printer is different and it also depends on your filament and if you are drying it before printing. you will have to test and adjust on your machine. Hi, so nylon is not good for all gears, so the micro gears of the differential are enough and the pins rotate ?? I printed all in nylon so in doing right I was wrong, you have the gear in pla ?? I have printed them in caRbonfill before and they are broken immediately I attach the photos .. I mounted a 21t engine I have to switch to a less powerful one? the PLA is strong enough for the larger gears, the bevel gears are very small and right on the edge of a .4mm nozzle being able to print them so nylon will take the higher temps in the smaller area and produce a better bevel gear. the nylon can also take shock loads with out cracking off the gear teeth. you will need to come up with your own formula for printing them on your machine. the small bevel gears should rotate on the shafts so you may need a set of MM drill bits so you can resize the holes for the shafts. i use all steel shafts in my trucks so i have changed the bevel gears from 1.75mm to 2mm shafts. all my large gears are printed in PLA. if the gears fit very loose or skip under load then you need to readjust your printer as the tolerance is too loose and the gears moving around too much. you can compensate by increasing the extrusion multiplier. carbon fill not printed correctly can be brittle. you will need to run tests to see if you are printing too cold or too fast. otherwise go with PLA it is strong when printed correctly. also carbon filament requires a hardened steel nozzle. your slicer is seeing the bearing lip on the right shaft. the bearings slip from the outside inward. bearings are usually undersized a 12mm ID bearing usually ends up around 11.90mm the 11.8mm gives a tolerance clearance of .1mm which is the average for Extruder 3d printing. if your bearings are not fitting then usually you have over-extrusion. the Hex ends will fit with almost zero tolerance into the large bevels so you usually have to hammer them into the axle shafts to seat them. as is the STL files are all fine except for the amount of clearance between the countergear and the diff gear in the gear case. there is a little debate as the stock placement will skip under load, there have been 3 major revisions to the axles and the design has been altered greatly from how it was 2 years ago. it still works but if you are skipping then you can try my 29T diff gear to take up the extra spacing. the stock HEX dogbones wear out fast and i recommend the CV conversion for the truck. https://www.thingiverse.com/thing:2504465 And this? Since it is this: unfortunately I have to reprint the change I will try, mount the same gears cgb02 ?? yes the CV system is superior to the hex/dogbone type. you will have much smoother power transfer and steering. 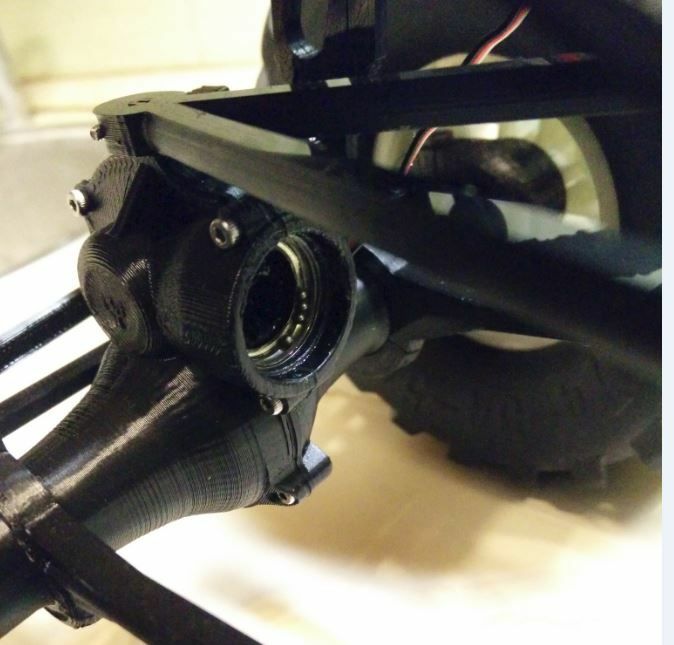 Since you've already tried it, you have the joint balls printed in Pla, in nylon so you have printed the 4 micro gears, the one that goes to the center of the differential and only the screw that serves to hook the right wheel ?? you want the nylon where the most shock loads are located. these are the small bevels and the wheel axles. the steering linkage can also be made from nylon if you wish. if you have to sand the shafts to fit the bearings then you are still over extruding. now one issue with printing the axle shafts from nylon is the 4mm bolts for the wheels will not fit. you will need to predrill them to except a 4mm tap and use a 4mmx.7mm pitch tap to finish the wheel axle bolt holes. this is because the nylon will shrink compared to PLA. printing the small bevel gears in nylon will be difficult i recommend, splitting them from the STL then turning them over 180 degrees so the wide base sits on the bed, step out about 12 of them so that you have space between them to cool and prevent over heating(melting) use a raft and a brim to help hold down the small bevels as the white glue will not be enough on the bed even with a PEI sheet on it. .2mm resolution and you should get good results. also because of shrink with nylon you will need to drill out the center of the small bevel gears with a drill bit. i recommend 2mm instead of attempting 1.75mm and switching to steel rod 2mm shafts to complete the diffs. they will be much stronger and run smoother. For the aces I will do an over-extrusion, the 29t already tried it but it was too big and it just couldn't turn, I know that the problem is gears because the ones that I mounted could not turn in the steel rods I know that the problem is that, Where do I find the conversion to cv? Hello, first of great work with the design, loving it so far. Almost have it done and ready to race away. But I'm having an issue with the body3 stl. It slices in a way where it breaks the roll bar mounting holes, and cuts them off half way trough, running it trough a stl fixer makes it a bit better but the full print still comes out a few cm short so it does not reach the rest of the 2 body parts when mounted on the poles. I have it sliced in Simplify3D. The error detection does find some issues with this particular stl. 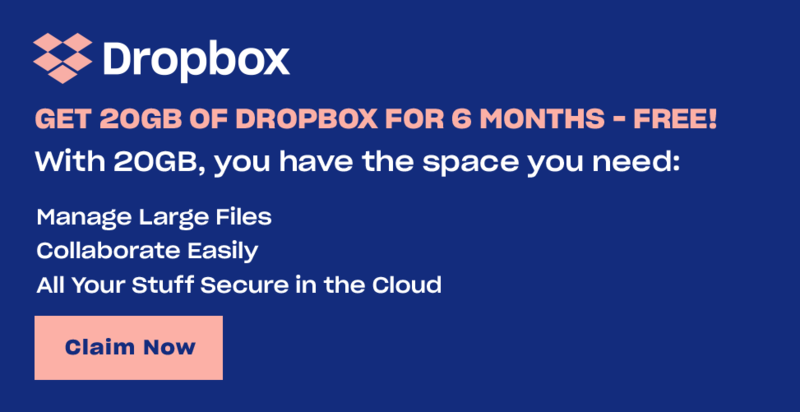 Has anyone here had any similar problems with this file? no, I just re-downloaded the newest files and put body03.stl into Slic3r and it worked fine no errors. preview looks ok for me as well, but once prited it has issues. I will try to print it with slic3r pe. Edit: ahh 7 of 3mm x 19mm and ? of 2mm x ? 3) Should I mirror the (split) frame pieces for left vs right sides before printing or just use one backwards? Thanks again for this cool project to get me using my printer again and some quality time with my son. The bearings hold up well now, I printed the file shaft01 with a width of 102 and as you can see from the photos hold well, I put a 3.5 mm rod so keeps everything as straight as possible, I'm wrong something from the photos I posted ?? Because of all the problems reported I'm going to print a new complete gearbox to see if I can replicate it. No problems with the one I printed. Are you guys assembling it correctly? Are you not using the 3x19 mm rods? You can help me, I have mounted everything but jump the gears, practically sliding both forward and back, if I raise the car seems to work if I put it on the ground does not walk what can it be? the differential lock is not mandatory right? No, it eliminates the differential function. Hello, but the cardan wheels also turn to you a little crooked ?? But I have not yet tightened the screws of the shell GB03 because they must deliver to me may be that once screwed will be fine? wow man that turned out so good! this is now my next project its so kool i need it lol. great job! how well does it hold up under load has it broken parts yet? Which servos are you using? The one in the description or another one? Maybe there is a cheaper one, which fits this truck? the ones in the description: the servos are 12$ each , for a metal gear with a good amount of torque they are already a good deal. they are more expensive on ebay. Where are the 4 to 8 3x7x3 bearings used and how many should I use? but the model has the steering both forward and back? so I need 2 servos? cmq for the gears I took the pla with carbon fiber I will let you know, if you have more photos of the assembly would be welcome ..
they are used in the upper counter gear the gear that connects the 90 degree bevel to the lower diff gear on the 3mm shaft. you need 4 of them. yes 2 servos and a Y cable or you need a radio that can be setup for 4ws. the gears work fine in PLA just the small bevel gears should be made in nylon. the assembly of the CB03 axles is basically the same as the CB02 you just assemble vertical instead of horizontal. the pics above are enough to figure out how it goes. the axles can only assemble one way. due to the diff off-center placement. m sorry but I did not understand the 3x7x3 bearings go into the central differential where the engine houses? you will have to look at your slicer settings and possibly adjust your live Z. if you have been printing at .3mm then switched to .2mm then look at your first layer height setting in slicer. typically no matter what your layer height is you have the first layer set to a fixed .2mm height. this is set in the slicer. this keeps the first layer height at the same starting point for all resolutions. my guess is your slicer has the first layer height set to the same number as resolution. so you ran at lets say .3mm height and set your live Z for that. now you have gone to .2mm and the first layer is not being squished the same into the bed to start the print correctly. so increase first layer live Z so you get a good first layer and the rest will follow. keep in mind when you switch back to .3mm you will need to decrease live Z or it will squish too much. if you print at .15mm then you will need to increase live Z again more then you had for .2mm. again you can setup all first layers in slicer to be .2mm for all resolutions then keep the live z the same no matter what the resolution is after the first layer. you might want to either go with a PEI bed in place of the glass or kapton tape attached to the glass to increase adhesion.another option is putting the printer in an enclosure to keep the ambient temperature around the part more stable to reduce warp and lifting during the print. you could also increase bed temperature if you have a heated bed. i do not use the ender 3 printer so that is about as far and i can tell you to go. most printers use a .4mm wide nozzle. the layer height is variable. .2mm is the height in this case. as it is a lower resolution but creates objects faster. in this case the resolution is 0.2mm which the height of each layer in the Z direction(up down) while .4 is the X/Y left right front and back resolution. the .2mm is the height of each layer. 1mm at .2mm height means the nozzle will move upwards 5 times to complete that 1mm thick part. So in practice with the noozle at 00.2 mm we only put more time but the result is equal to that from 00.4mm ?? I used the GB03 on the rear axle and I get no friction between the top gear and the diff gear. In front it works, because the direction is changed and the upper gear will be pressed down. On the rear axle the upper gear will be lift up a bit and get no friction. The car is not running. I reprinted all components and assambled complete new parts, but the truck won't drive. Have anyone the same problem? What can I do? The new gear works very well, it perfectly fits. Many thanks for this. Good work. Where can I find them? Or do you have photos to understand what they are? these are just shafts you need to support the gears and axles. they are round solid rods that you need to cut to the correct lengths so they fit into the different area where needed. you can use 3mm nails where you cut the heads off and then cut the length down as needed you can use 1.75 filament where the 2mm is used. however if you use the filament i would use nylon 1.75mm in place of the PLA nylon properties are higher melt temp a slick surface and it will not fuse to the PLA when it heats up. i would recommend not using the filament and go with the steel shafts as the gearbox will be much stronger. i also recommend printing the small bevel gears in nylon 910 and the wheel axles in nylon 910. the PLA tends to shatter under the loads and shocks from jumping nylon is much stronger then PLA and will absorb impacts without cracking or breaking. For the 2mm rod you can use 1.75mm filament, it will only used for the diffs. Usage is documented in pictures on the project. For the 3mm rods I used 3mm x 40mm nails and shortend them. this works very fine. Currently printing one now, I am using clodbuster tires and rims with a 12mm hex, also using some friction shocks I found in the remixes, should do well in snow and mud. Seems M3x10 work everywhere but the knuckles. M2x8 worked to hold the main halves of the axle together, but need longer for the input cap (or drill the recesses for the heads deeper). your slicer can handle this, there is a split function in most slicers, when you click on it the STL file is split into each of its components. and then you can delete the pieces you do not want. another option is you can download meshmixer from autodesk which is free, load the STL then click edit and click seperate shells. then you can select the pieces you wish to export back into STL files. this will separate all the little groups of parts. Thanks, just realized slic3r could do this! i would recommend printing the small bevels in taulman 910 nylon. PLA doesn't last long because those bevels get a lot of shock loads. PLA is brittle so i tends to chip teeth off. nylon in this area works perfect. i use 910 for the wheel axles as well, if the tire hits something it tends to snap the PLA wheel axle shaft right at the outside bearing face again shock loads with brittle pla. nylon here is flexable and i've never broken a 910 axle. i also find i get better print quality on the small bevels if it turn them 180 degrees so the larger side is on the bed, then raft the bottom lip and print the gear from fat to thin. the other way around usually requires a brim to keep the gear from popping off the bed and it melts the narrow areas a little too much and makes it harder to clean the gear up after the print is complete. Thanks for the tips. I'm trying PETG for the gears while I wait for nylon. The little ones are what I had some trouble with, I did use a small brim to keep them down, but the teeth did not come out so great because of the small-perimeter overhangs, I will try flipping them over. Have filled one filament roll bag up with parts so far, and still have the body to go! for the nylon run it hot but run like 8 bevels at the same time spread them out a bit. this way it will cool the layers more as the total time per layer will be higher. the nylon will shrink a little but you just need to clean out the center shaft holes with a 2mm drill bit and it will still be ok for 1.75mm filament. although i recommend going with the 2mm steel shafts in place of the filament shafts. Build's nearing completion, ran it around the house with front steering only and a 23t motor (35t en route). Steering's a little limited because i cut the servo horn too far to clear the bottom link, gonna try flipping the servo in stead to allow for a longer horn, think i'd rather than than move the lower steering link down and attach it to the knuckles from the bottom. Having a small problem in that the tips of the body posts are not long enough and do not protrude above the hood and bed of the truck body far enough to get some clips in the holes. Anyone fix those yet? did you use the correct body posts. there is nothing wrong with those STLs. the bodypostXX.stl files for for after market lexan shells. That was it, wrong posts, I didn't even realize they were in Body04. Thanks! what you mean, is it possible for the rods 3mmx19mm to use threaded screws m3 for the bearings 3x7x3 ??? basically if you are short on materials you can adapt a 3mm bolt. you can chop the head off the bolt and use it as a shaft. you can also go to the home store and buy some nails that measure out to about 3mm(just under) so you can cut the head and pointy end off and use it as a shaft. you can buy ready made 3mm rods and chop them to size as well. 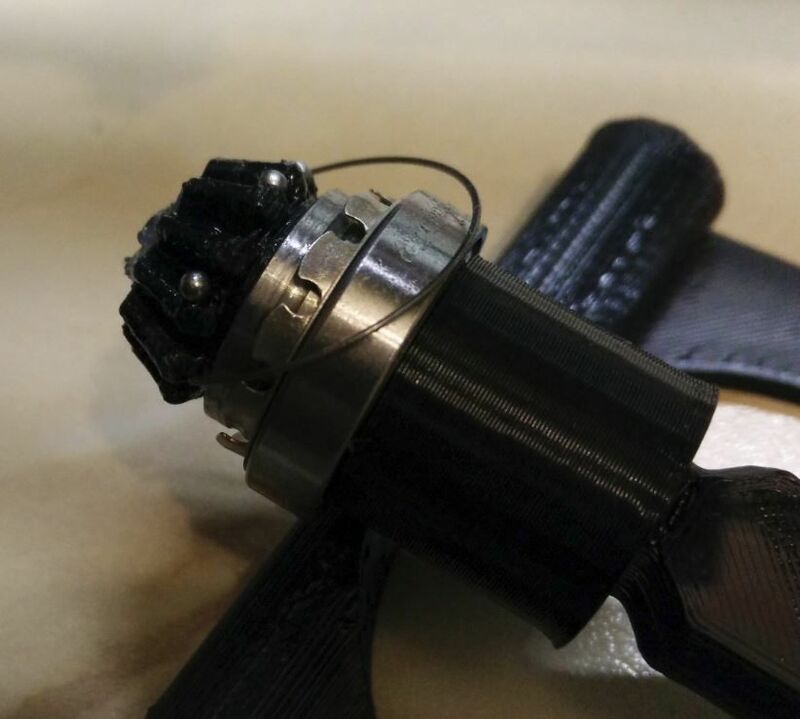 it is also possible to 3d print the shafts. all these options give you flexibility to help you create the truck however depending on the method for the shafts you have pluses and minuses. the best option is to purchase some 1mm, 2mm and 3mm shafts they come in handy for different projects. for the ursa bear you will need 2mm and 3mm shafts to create the strongest and tightest drivetrain. 3mm is used on the main shafts and 2mm is used for the small bevel gears and if you decide to convert to CV driveshafts. everything is optional so it will be up to you how far you want to take it. loose tolerances in the gearbox can cause the gears to skip or become damaged from incorrect meshing under load. additionally using Nylon in some key areas helps to increase the trucks durability. changing the small bevel gears, steering servo arm parts and the wheel axles to Taulman 910 nylon will remove some weak spots that PLA or PETG can cause.combined with proper 3mm and 2mm shafts and converting to 3d printed CV joints can actually bomb proof the driveline , free up friction and make the truck drive much nicer. the truck is a really good design that allows for a lot of flexibility Tahustvedt really came up with a winner here. so take it slow take your time do it right and you will be amazed. Thanks for this detailed answer. I have already bought 3mm rods and I will probably print the parts later in Taulman 910 Nylon. Maybe, but M3 screws are usually slightly thinner than 3 mm so you might end up with a looser mesh. Do you have any special instructions for printing the wheels? how many infill? Do I have to glue the tires on the rims? it is really going to depend on your TPU and printer. most of the FLEX TPU is still very stiff even on minimal settings. ideally you want to have 1 perimeter because that will leave the TPU tire at its softest. however you may not be able to obtain this with your printer. be aware these tires can take over 40 hours of printing TPU flex has to print extremely slow. so try to dial in your TPU/flex setting before even attempting it. you also need about 2 spools of TPU as you can print about 3.5 tires before running out of material, if you don't have a filament sensor then you will want to stop after the 3rd print and swap spools. i never finished a successful set of TPU tires for my usra bear. at 2 perimeters and 5% infill the tires were WAY too stiff and as i experimented with 1 perimeter and 0-2% infill i had top layer issues. the cost well exceeded just buying tires from china so i gave up, but i have about 6 TPU printed tires with different degrees of failure. another reason i stop was the time involved. well over 200 hours. smaller tires i continued to make for open rc f1 and some other homebrews where the print time was around 12 hours. it would be faster to make a inverse mold setup from the ursa tire and pour RTV silicon in the mold and create a tire that way. but back to the tires. you want 1 perimeter if possible and as little infill as can get a away with as it will also stiffen the tire. the best would be 0% infill then cut the inside center of the tire open and insert a foam doughnut. as for glueing the tires they fit pretty well on the 2 piece rims, however you can just put a couple of dots of CA(crazy glue at 9,12,3, and 6 oclock around the tire and it will be more then enough to hold it. for the rims. you want them strong and having weight as low as possible makes the truck less tippy. so run them at 100% infill with 3 perimeters. I have seen that in front and behind each a servo is installed. how are they controlled? separated from each other with one channel each on the remote? You can control them separately if you want or together. Full scale monster trucks have both the ability to control them together, and separately if needed. If you have an advanced transmitter you can add mixing with different steering modes.If you have a simple transmitter and want to control both at the same time you will need to reverse one servo. Reversing circuits exist for that purpose. fantastic, thank you... great job. This is probably a calibration issue. The brake should not engage until you activate it with the stick. Hi again. Does anyone have the steel rods for the build lying around they want to sell and can send to New Zealand (at my cost) as I can’t find them anywhere. I have 5 of the bigger rods, but need the rest and the small ones. Thanks in advance. FYI, clear 3d filament isn't very clear at all. no matter the brand you get a fogged over look where anything an inch away from the material is impossible to make out. so if your expectation is some plastic model clear window that will not happen at all. the design with the windows on the ursa is to use clear plastic sheets and cut them out and glue those in since you really cannot 3d print clear such that it looks as you expect. the body will also be weaker since the windows are separate pieces, so on roll over it will cause a good amount of damage to the body. Hi Superclodbuster, Thanks heaps for that. After reading that I think I will just print the whole body with windows and vinyl cut stickers to go over like everyone else is doing. Thanks for that. PS: Nice job on your builds. me, i just hand painted it flat black with a brush. it was faster then trying to cut vinyl sheets and it doesn't peel off, you need to have a steady hand and a good brush. originally i spray painted but the masking took too long. Tamiya paints make the job easy. Front and rear is the same, so print two gearboxes. GB03 use the same gears as the old housing. On the details page you can see my update notes in chronological order, from the bottom up. The top update notes are the newest. Your second line - I wanted a monster truck that actually looks like a monster truck, and not a truggy with large wheels..... is exactly why I am making this! thank you! should be finished in a week or two. Would this body fit on a HSP (FTX) V1 Outback? i'm running into a strange issue. not sure if something got corrupted in the last update of the stl files. i downloaded the most recent files because i switched computers and i needed to run out another set of axles. the new axle that came out instantly started making popping sounds when i tested the new truck. i tracked the problem to the upper counter gear between the bevel and the lower diff. there suddenly seems to be too much back lash between those gears and now the upper counter gear is skipping on the diff gear under load. i managed to force the gears to fail so i could see the issue clearly. i can see no movement between the top of the axle cover and the center section. i laid the parts in fusion 360 because i also want to beef up the mounting hardware that is cracking under stress from the walls being too thin for PLA. but if you could check the tolerances again on the axle case and counter gear and lower diff gear. the Bevel gears are fine. I thought to splice the axle case and drop the countergear down .1-.2mm and see if it would be enough to tighten the backlash and stop the gears from skipping under load. I tried to tighten up the lower tolerance because i thought there was too much play in the lower diff bearing holders but that part is fine so i went back to the original tolerance. i believe this is the issue Marcus24 is talking about in his post. I haven't changed anything in ages. The halves of the gearbox are not pefrect half circles, because that wouldn't work when printed. I made them slightly taller than half circles to compensate for overhang artifacts from gravity in the arch. There would be a huge gap between the halves otherwise. There's already a small gap as it is now. well something changed i had an older version from when you just added the 03 Axle design going from the side to side assembly to the top down for strength and using the newest stl files i have the same issue that Marcus24 commented about. the difference with Marcus24 and me is i forced the gears to destruction so i could see the failure. the teeth are not engaging deep enough with each other under load and the tops of the diff gear teeth are snapping the tops off. all the bevel gears are fine and no problem with the input gear nor the diff gear bevels. before destroying the gears i started to feel them by hand and there was more backlash then i would of liked between the diff and countergear which is why i suspected they were skipping on each other. last time i printed a truck out was last year. want to look into the gear mesh see if something isn't correct? I will have a look. Too tired today though. keep in mind this damage occurred with new PLA printed gears, brane new axle case, and i forced this damage with the truck on my bench sitting wheels up and i just gunned the throttle with no load just the weight of the tires, 2 teeth are folded over on the diff gear same contact area as Marcus. to me looks like 2 things the back lash/spacing changed somehow and is further apart and the 2 gears to my eye do not look like the profiles are the same. the counter gear looks to have a deep tooth profile compared to the diff gear.  (different pressure angles and clearance distance) i had Gearotic do some weird mistakes on some gears i created, and i switched to opencad to double check on my projects. sometimes you get very different results with the same PA and pitch between programs and bump up one tooth and it fixes itself. possible the diff gear is off by one tooth? well started to mess around this evening. my software was having a problem generating a Pressure angle of 20 with 28 teeth Module 1 trying to match your clearance (backlash) it was making the software bug out. i guess you must of manually closed off the gear backspacing to add strength to the diff gear which is why the software refused to create the gear profile correctly. well i decided to try out a 29T diff gear with pressure angle of 20 and module 1 with some backfill to strength the teeth, so i'm running it out and see if the mesh is too tight or not. Cool. If the 29 tooth gear fits then it should be a good fix. The mesh is a little lose in CAD so the reason it skips is probably because the axles aren't round, but flat, so when they are on the flat side perpendicular to the gear line they give a little less mesh. Wrapping one layer of aluminum tape around the two drive axles to the wheels will probably tighten it up if the axles are loose in the bearings. The 29T is working on the current axle there is just enough clearance to not have a major issue. might not be a bad idea to have both options of a 28T or 29T diff gear so you can choose a tiny change in the final drive ratio LOL :-). I adjusted the CV Joint by zxcvbn also. there was too much play in the original part for PLA printing. the input was wiggling bad. that was causing the bevel gears to destruct. finally the weather got nice so i could start doing testing again which is why the sudden influx of new issues. I am working on a slightly beefed up axle case for PLA printing the amount of material around the bolt holes is too thin and the parts are Cracking just from the hardware sitting in the holes. so i beefed up the Diameter of the holes with 5mm and i moved out the 2 center axle case bolts to give more clearance and changed them from angled mounting to straight up and down. the upper cover also needs a similar beef up. here is a photo of the problem. the Gold paint indicates a crack. same areas cracked on 2 different trucks. off to go break it again :-D.
well the old Hill billy engineering solution works: keep adding stuff till it don't move or break :-D.
i know it is frustrating getting dragged back into an old project, i'm over a year into one of mine. but sometimes going back and working on it again gives you insight into your next project or another one where a similar solution can help it as well. i think it is a great design and a good truck so worth the frustration. I have problem with GB02-gears, I printed them from ABS and i used vaseline on them. They look strong enough. In hands it moves nice without problem. On the car with motor it moves, but it makes noise and they are skipping. Gear teeths are ok, none is broken. Any ideas where there may be a problem? could be many reasons. first make sure the slipping is occurring where you think it is. ABS shrinks more it could be possible the bevel gears are smaller then they should be. there could be too much play in the bevel shafts. are the bearings putting correct side load on the differential, if the clearance is too loose then the diff can slip or pop bevels. i made my Bevels out of 910 Taulman nylon. are the axle halves sitting tight together, if they have play in them the load can force the axle top and bottom to spread and cause the gears to pop or skip. Sometimes it might be a good idea to force destruction to find the problem. run the truck until the gear fails then you can pinpoint he issue. I reprinted all gearbox files with PET. I used GB03, GB02-input-onepiece, and GB02-gears. My printer is calibrated. And it still skipping under load. I upload gear picture, part in red rectangle is skiping with the large differential gear. I used a 35T motor and a 3S 60-120C battery. GB02-gears will continue to break. All parts were printed with 100% PLA. either formula a stronger PLA Slicer sequence. less fan more fusion of layers. or if you are snapping off teeth then you need to move to ABS or Nylon filament instead of PLA. i like to make the small bevel gears from 910 Taulman Nylon. Try 2S battery or 55t motor instead. You can also print the gears in PETG for alittle more strength and elasticity. Always lubricate the gears with grease or they will break very quickly. Thanks for sharing your design with us ! The link you provided for the 2S LiPo in the description seems to be wrong: it's actually a 3s lipo. What should I buy, a 2s or a 3s battery? For what I understand, if I chose to put a 3s LiPo instead of a 2s, the speed would be faster, but I will lose some torque. Am I right? Other 2S hard case packs work too. 3S is pointless no this car. I have a question about batteries. Did you use a couple of 3-cell battery packs in series or a pair of 6-cell batteries in parallel? It is similar in the case of LiPo batteries, right? That is, two packs 1S in series or two packs 2S in parallel? I ask because according to the specifications of the ESC that you recommended, it supports up to 9 cells in NiMh or 3S in LiPo. So I estimate that I can not use two 6-cell NiMh in series or two 2S LiPo in series. The regular frame supports a 6-cell ni-mh stick pack, or a 2S lipo hardcase battery. The saddle pack frame supports saddle packs, which are either two 3 cell ni-mh in series, or two 1S lipos in series. One on each side. Hi, I'm printing the model but I'm new to the RC. Since I have to buy all the hardware, do you recommend me to use a brush motor or would it be better to use a brushless motor? If it is preferable without brushes, what engine and ESC do you recommend? i use a stock silver can 540 motor and it is way fast enough and has more then enough power to have a ton of fun. i would recommend printing the small bevel gears, pinion gear, and wheel axles from taulman 910 nylon instead of PLA it will make the drive- line heat and shock resistant. there are many upgrades for the truck from other authors that will increase the trucks durability and performance. i also recommend some type of heat break for the motor to reduce heat transfer to the PLA as it will melt. a tamiya phonetic motor spacer is a good way to stop heat transfer. I have melted the pinion gear which is why i went with 910 nylon as it absorbs heat no problem. my trucks have tons of upgrades from thingiverse and also home brew to increase performance. Brushless is superior to brushed, but brushed motors are more than adequate for this car, and cost less. It's difficult to find brushless motors that are "slow" enough for this truck. Most are too powerful to give reliable performance with the printed gear train. A 1000 to 1200 kv brushless motor would work well, if you can find one. Outrunners will work as long as they are the right diameter and have the right shaft size. I still recommend the 35T motor in the parts list on the detail page. spring has finally sprung and i had a chance to beat on my Ursa with some new beefed up parts to the driveline. I'm running zxcvbn CV joints now. i'm noticing stress cracks on all the 2mm bolt hardware around the new designed Axles( vertical cracks) from the hardware pulling the top and bottom axle case together. i think the axle wall around the 2mm hardware needs to be beefed up 1-2mm to compensate i'm using PLA. i noticed the same cracks on another Ursa truck that hasn't been run much so i think the cracks formed with the truck just sitting on the shelf over time. the parts have not failed yet but the cracks indicate not enough material to take up the stresses. the new CVs work very well on the ursa truck. i have not tried the new Ball diff design that zxcvbn came up with. I think I need to make the inside cavity around the bearings bigger so that the bolts don't stretch the housing when they are clamping down on the bearings. the outer bolts by the steering pivots didn't have much pressure on them like the 2 center bolts for the bearing carriers but they cracked as well. i think Thin PLA under stress will crack like ABS. i figured beef up the thickness wall a little and see how it holds up. if you open up the bearing carrier tolerance you have to be careful not to go too much as then the gears will hop under load. right now with the cracks the axle housing is staying together. but i did see horizontal cracks forming in the center section. I had a mauri big bear when I was a kid... I will never forget how many times my father was bringing home gear sets for it... lol.. excellent job on bringing an original back! When the car moves, the screw (M4x20) is released from the wheel. So I tighten it repeatedly. I used 4mm star washers they are like a spring washer to help keep the screws from getting loose. You could also tack some crazy glue on the thread then install them to help lock them. Wow!! I did not think that. applaud your idea. Thank you. another thing i did was i made the wheel axles from Taulman 910 nylon. PLA was too brittle when i really beat on the truck so nylon axles allowed flexibility from impact with the heavy tires on an object. the nylon shrank a good deal so i had to tap the 4mm screw hole after printing was completed. the shrink of the nylon and the tap left my wheel bolt very tight in addition i used the star washer, but i also had to go back and make my own wheel hex adapter to tighten the tolerance back up otherwise the PLA wheel hex slipped on the Nylon Axle Shaft. no big deal just some quick work in Fusion 360 to get the revised parts out. the small bevel gears in the axles and center gear case should be replaced with Nylon instead of PLA and i would recommend changing from the PLA filament for the Bevel gear shafts to 2mmx8mm Steel shafts. it takes extra work but you beef up the drivetrain. print yourself a center skid plate also. for fun i remixed some of the gears for use in a FWD i made. i may release it in the future. I couldn't find the recommend servo and its out of stock, is there an alternative servo that you also recommend? I've found below servo and I don't know it will fit your design? Most 23x9 mm servos will fit. Do you have the original cad models you could post? I would love to try to convert this to nitro. Sorry. I don't give away the originals for my designs. Can you steer the four wheels with the 2 channels transmitter? I bought the following parts. I don't know how to connect the parts. The parts you have bought are standard rc car components. I assume that people who build my cars know the basics already. The GT-2E comes with a receiver which communicates with the 60A ESC and servos via the three lead cables. The instructions should describe how. I don't know what difflock is for. They go on each side of the diff gear instead of the small gears. That way the differential is eliminated for more grip on loose or slippery surfaces. for example snow. Should glue be used to assemble motors and first CGB gear? I don't use glue to install the gear on mine. Hi, I enjoy your 3d printed truck and I want to print it but I want to know if any piece is more than 120120120mm? scaling is all wrong what should the scale be set to? This is a problem with your slicer. Hello! I built one and the truth is great. I wanted to propose an improvement: are you capable of making a self-locking central differential? With a servo for example, to be able to lock it and unlocked from the radio transmitter. You'll tell me what you think of the idea. Hola! He costruido uno y la verdad que va genial. Quería proponerte una mejora: ¿serás capaz de hacer un diferencial central autoblocante? Con un servo por ejemplo, para poder bloquearlo y desbloqueado desde la emisora. Hi, I have a problem with the rear or front gearbox. It "slips". The differential gear miss gear with the upper one (the little one). In my case, I think the distance between those gears are too long. Any Idea wath to do? So cool!!! How fast can it go? About 16-17 km/t with a Tamiya 380 motor and 20+ with a 540 35 turn motor. Hi everyone one, I think that shaft01 goes in the GB03? Why there is a long and short shaft? yes, Shaft01 goes inside the GB03 parts. shaft 01 is the Differential axle shafts. there is a left and right because of the counter gear clearance and the diff sits off center. look at the picture for the CG-02 diagram version for the shaft placement. when you assemble you will see why they are different. A bigger servo will hit the frame. I see. Will a 3.5kg torque servo do? One of the corona servos i ordered seemed defective, I think I have to replace both so the two servos are the same. The 3.5kg torque servo is what we have locally. By the way, I killed another set of input GB02. Everything worked fine. But after putting in some load (running the rc), it snapped after a few minutes. What am I doing wrong? Tried printing the one piece but the bearings are tight fit. The printed part got removed from the bed while fitting the bearing. The frame04 (the very small one) works ok. Also, I have modified the frame03 by cutting a couple of rods so the servo can fit - it is also uploaded on the remix. I have uploaded on the remixes a solution - a gearbox for use with standard size servo. Use at your own risk. the tighter the fit the better, but you can also use some CA glue to hold the bevel on the shaft and keep it from wiggling and rounding out the hex on the shaft. Also consider trying the one piece gear. You pause the print and add the bearings, and then the printer prints the shaft as one piece with the gear. Tried the one piece. The bearings were a tight fit that I accidentally removed the print from the bed. Will try to remix to shave some mm from the shaft for easier fit. The shaft is already 0,1 m undersize, at 11,9 mm, so the bearings should be a nice slip fit. Your printer is probably overextruding. you should run some Dimension test pieces like a 20x20x20mm with 1mm Wall cube and see how off in the XYZ you are then adjust the printer or your slicer settings. you can compensate for tolerance issues and see if you are over extruding. it will show you the limits of your printer as well. you could be over-extruding, Too hot, your multiplier could be wrong, etc. Will have to check and re-calibrate my printer. But everything else i've printed on this project was a "perfect" fit. Most likely some of the settings were changed when I re-flashed Marlin to adjust the temps to accommodate nylon printing (for the gears). Anyways, I've finished printing the remixed one piece I did and already assembled it. Will test later this evening. Thanks guys! Ok. Tried another run and the one piece input seemed to work fine. My problem now is the servo steering (did front steering only as my other servo is failty). The steering servo does not turn fully both ways. After a few degrees of turn, it woild chatter or make slipping soinds. Any ideas why? Sorry, Im a noob when it comes to RC. bad servo or your linkage is binding causing stress on the servo. is your servo saver setup and working correctly. everyone has a different servo setup with this truck. the servo saver must be used, direct drive between the servo and steering linkage will cause failure. when setup properly the wheels will just move a little bit when the truck is sitting still. under motion you will get full steering. this is normal and wanted behavior. Whats the maximum length of the 2S lipo batter that can fit with the printed shell? 138 mm will fit great. You can fit slightly longer packs by letting the body flex a little. Awesome. Looks better than my pickup. Just started the marathon task of printing. The large chassis side plates fit onto my CR10 so that's good. Many thanks for posting this, I just hope I can get it finished and running. If it works, I will have a go at designing a 1/14 crawler truck, preferably a 6x6 Oshkosh or similar. I've already done a few 1/16 tanks. the axle shaft that clears the counter gear in the axle and has the little ridge to hold the bearing seems to be a weak point. the forces are so strong that the shaft is jamming into the bearing which wears away the little ridge. eventually the shaft cannot hold pressure against the diff bevel gears and then the transmission starts slipping. i didn't look into the clearances but a sleeve over the shaft that goes back to the diff bevel gear and fits between the bearing and the bevel gear would support it much better under load and prevent the axle diff from slipping. Finally got the first test run of the new driveline and version 3 axle cases. added a tamiya motor heat shield between the motor can and the PLA CGB housing to reduce melting of the PLA. the heat shield is basically a plasticized paper to reduce heat transfer. after melting a few pinion gears i also started making them from 910 Nylon. the wheel axles i make from 910 Nylon as well. will be modifying my steering setup as adding rear toe is a great idea for more straight stability. i just completed the second run with the second truck, so far so good. It would be a good idea to hold the beveled gears (GB02input) in place, similar to the CGB with a colar or something. I've split a couple of diff side gears since you updated them, I might try add a bit more meat to the back of them if there is room. Never spilt a diff housing yet, they even survived the time a idiot sat on it and broke everything else. Maybe they're coming out too tight on the shafts? That can split them as the tension forces will be incredibly high when the parts are forced together. Some PLA is too brittle for this and is unable to deform enough. Always made sure there not to tight guess it's just the weakest part in the diff now. I printed everything in abs it's all I've ever used. You might want to try PLA. PLA is 50% stronger than ABS. sweet more printing to do! started printing the new GB03 axle cases. I decided with some of the overhangs and bridging to fully support them. so far got one set out clean up went easy. it took me about 6.5 hours at .2 resolution 100% infill 210C degrees, i wanted good fusion of the PLA. second set is running now. hope to start assembly today. phew 20 hours printing just finishing up the first truck with all the new upgrades. I'm going to try a hotter motor in my red truck now that I have printed pin drive axles. A 21t motor will make it able to jump well on my track... I think. Im building this project now and at around 80% of the printing. Im having trouble with the body. Im not sure if I can print it without support since there are details in the hood and rear part of the body. Im using Cura and am not sure if it can be done in cura. Any suggestions on how to do this. my first tests of the body were done with supports and they caused more trouble then they solved. you also do need to add a 100% fill layer where specified on the thing details readme. you have to go into the slicer software and force a 100% fill layer just under the grill for the front and just before the tailgate starts on the rear this is so the details have an attachment point for the bridging required. this is to keep the body shell as light as possible. 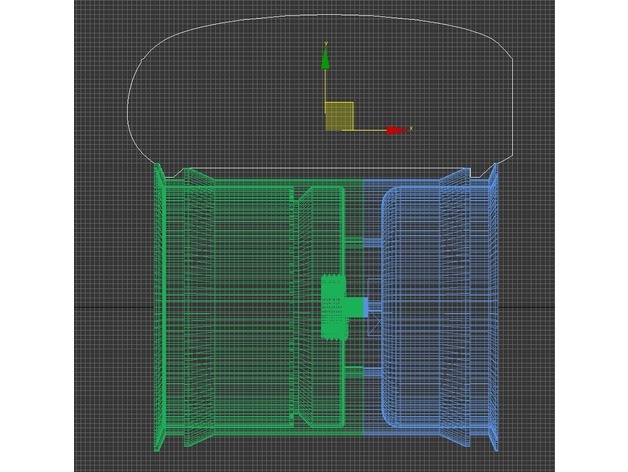 you can also add 100% or higher fill areas using advanced slicer software settings to re-enforce areas around the body mounts or the roll cage. I printed all mine without support. Cura should be fine. Let the print finish even if it starts bending up towards the end. It will workj itself out before it gets to the top. Printed without supports and adjusted my layer height to 0.4mm. Pretty satified with the result. Just waiting for the tires and off to assembly. Thanks man! Is there a parts list on hardware? I start printing parts up but I don't have the screws or bearings.....so I need to go to the store to get them. I just was wondering if you had a list of hardware. All hardware is listedon the main page. started printing out the new shafts with pins. I stripped out the rear shafts on one truck so Perfect timing. what is the best choice for motor esc? It will take any stick shape batteries, including shorty lipos. i just downloaded the newest version of the files and Difflock02.stl is not inside the files folder anything else missing? I didn't see a difference with the center diff having newer bevels in the files list so I thought maybe because the spool version 2 was missing that the center diff didn't get an update listed in the readme. It's a very complicated project and I'm on my own so it's hard to avoid mistakes. I'm making a second truck for a cousin so i wanted to get all the updates together for it during construction. Nice. I drew one just like it for my buggy, but never tested it. Great news that it works. You should upload an assembled pic also. BTW good idea. Will a servo with 2,2kg torque be enough? It will steer ok when the truck is moving. It will really struggle to steer when the car is standing still though. I use 2,4 kg servos on one of my trucks and it works fine when the truck is moving. I recommend the Corona 843mg which is an 4,8 kg micro servo. Maybe I'll get a bit bigger with modifications. i've printed a tire with TPU Filament and a wheel with PLA. When i put the wheel Parts in the Tire until they snap in, there is a space between the parts from about 10mm in the middle and i can not screw the Rim together.i think one part of the wheel is to short a little? The tire and wheels are an exact fit in the CAD. If there's 10mm between then something is wrong. Sounds like you put two inner wheel pieces together. i have not edited the files, only opened it in simplify3d and arranged. Wow. I have no idea what happened here. I must have changed the wheel by accident. Sorry about that. I'll upload a second set of wheels for the printed tire. You don't have to print new tires. IS THE BODY PRINTED TO? I'm still in the process of putting my truck together but i got it running for the first time yesterday. i'm working on the body right now and i noticed a slight problem with the Body02.stl, and body02-windows. there are a few areas in the body where the model is too thin and you get holes when slicing the model. on the body02 file the door panel gap lines at the bottom and bottom center cause holes in the slicer layers because they are too narrow. I filled in a corrected model on my end thickening the bottom of the doors .5mm per side to stop the issue. the body02 windows file has some more issues besides the same door gap issue it has some areas at the roof and top of the door frames being too thin and causing slicer issues. i noticed all this with .2mm layers. Use 0,4 mm extrusion width to print the body parts to save weight and avoid holes. The door lines will sltill have a couple of small gaps, but I left it like that because it's a door gap anyway, and hasn't given me any strength problems. The roof should not have any gaps when using 0,4 mm extrusion width. I welcome any mods and remixes. I went with the changes to the model, the extra .5mm per side thankfully fit my old NIMH 4000mill amp battery perfectly without stressing the sides of the body at all. I just finished the cab this morning took about 12 hours to print. should have it painted up and see if i have some decals laying around for it. I was afraid my printer was going to have a bridging issue with the door gap and i didn't want to take a chance on such a long print to have it go wrong in the middle. I love the truck thanks again for making it. I'm going to test out the new servo saver the only change is to the base that attaches to the arm everything else is the same. I added some spacers to the steering arms to move them out a little maybe i will make little PLA spacers to replace the extra 2mm nuts i'm using. if i works out well i'll see about posting a re-mix. I want to try printing the tires with ninjaflex as well. I put diff lockers in mine, I kept having problems with the front diff from to much wheel spinning as I drive it in a quarry. heaps better now for where I drive on fine lose rock. I used a 540 45 turn motor with a 2s lipo and its still crazy fast, I should have gone with a 55 or 70 turn for where I use it. Do you have the files for the tires? I would like to try to print some. Awesome design as well!! I designed some printable tires now and uploaded them. They should print fine. All other parts seem to be the right size. Shocks turned up from BG, put one on and saw it wasn't going to work mounted to the top of the suspension arm, makes the arm twist from the offset load of the shock. Have made new mounts that clamp to the diff, they seem to be ok so far. Might have another attempt of printing the body later with some new filament. The axles are 0.2mm undersized by design at the bearing location, to fit the bearings easily. My printer makes them about 11.7 mm, which is 0.3 mm smaller than the bearing id. Your printer must be printing undersize for some reason to reduce the size an additional 0.3 mm. I do not think it will cause problems, however. Don't think it makes any difference. 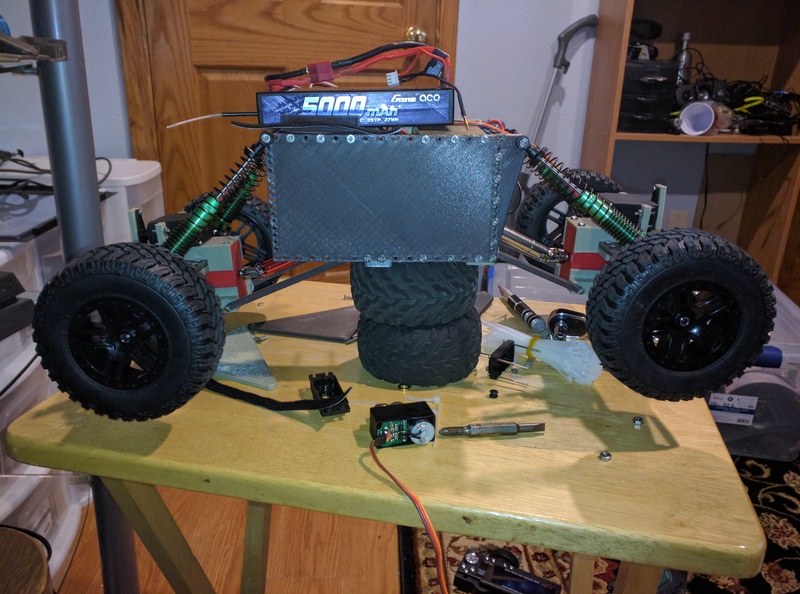 Monster truck abuse and nudges from a tiger :) - I'm about 1/2 way through my build and have some Rigid Ink nylon 12 filament for my gears so will report my findings when I finally get to drive. Sorry, I don't want to share the original Max files. Axles are 11.9 mm, which fits 12mm bearings nicely when printed. Wheelbase is 290 mm with the long suspension. short suspension is 20 mm shorter on each end, and can be combined with long suspension for intermediate lengths. I totally understand that, it must have been quite a task to get this together. This is so a must build, love it!!! Out of curiosity, how much does it weigh? -With the PVC Vampire Ghost body it weighs 1825 g.
-With the 3D printed pickup body it weighs 2085 g.
Hi there! I've begun printing, will start assembing as soon I finish. On Gears01, the gear with the bevel and the spur (to connect with GB-input) exists two times. Where is the second used? Why are the bearings used on pairs? One for each position, isn't enough? Also, I really love your bevel gears. Do you use a specific gear generator that I could use too? And again, congratulations on the design. Also, how does the motor pinion give power to GB-input? Could you share with us the assembly multicolor (probably layered) 3d-model shown on an image? GB-input is the shaft on the diff housings. It's not connected to the motor. The motor pinion drives the biggest spur in the center gearbox(CGB). Have you downloaded the latest version of the files? There are two gears with the bevel and spur because there are two axle gearboxes (Print GB02 twice). Using a single bearing on axles doesn't give enough stability and will cause premature gear and bearing wear. Please read the assembly notes if you haven't already. I will upload more exploded views. Yes, the new exploded views make that clear. Thank you. Thanks you, your work is so amazing. These pictures show some of the assembly. Look at the exploded views I posted. Very nice, I'm starting now to print it. Could you also upload the separate parts? I don't want to print all gears again because one of them didn't print well. You should be able to do that yourself in the slicer. I have used Repetier Host and Simplify3d and both let you remove separate parts. If I upload every little part by itself then it'll just be a horrible mess in the file list. I didn't know that slicer could do that. Now that you said it, I found it. Thanks a lot! I was in the process of designing a monster truck as well, ended up being more of a rock crawler that had issues. The redesign now has it being more of a stadium truck that uses the traxxas slash body. I will have to print this and give it a shot, since it is a better design than my first truck. Would be cool to see your design. And this is the current one which is not done and I am waiting for parts. I went with a printed frame but bought drivetrain. The project was never stopped, just changed form and now is waiting on parts so I can get measurements for the wishbones. The joy of have printed and not printed stuff together. Ursa (bear) - Fully printable Monster Truck by tahustvedt is licensed under the Creative Commons - Attribution - Non-Commercial license.